Olympic Design Group, Inc., architectural, residential, interior planning, historic restoration, and custom furnishings, Port Townsend, Washington. Design for Health-Build for life. Olympic Design Group, Inc. is a team of professionals that consists of Architects, Interior Designers, Decorators and Building Biologists. Together we provide complete environmentally sound, healthy home design with Built Green Certification. We promote energy conservation, resource efficient homes specializing in innovative, sustainable nontoxic products. Ann Raab, the Founder and an Architectural and Interior Designer has long been recognized for her house designs. She often begins with evaluating and assessing the site, noting solar orientation, land features, infrastructure, and site requirements. The client is an active participant. They express their needs for space and their budget. The plan develops by orienting the spaces to the sun, views and outside areas. We consider the owners needs of each space, traffic patterns, furniture, storage, lighting and how the room functions for multiple use. Quick model sometimes are used to help owners visualize. Vicki Beaver is a Building Biologist, Green Consultant and Environmental Educator. Building Biology is the science that studies how buildings affect our health, and the application of the knowledge in the design and construction of new buildings, renovations or remediation. Building Biology helps fix sick buildings and alleviate health problems associated with them. She provides indoor air quality exams, electromagnetic field (EMF) testing, and energy conservation consultations. Our goal is to design energy efficient homes using indigenous, non toxic and recycled materials, and reduce waste of resources. We have an extensive selection of "green" materials including pervious concrete and pavers, windows, flooring, countertop and recycled tile in our show room to inspire you. Our demonstration house, Rainshadow Environmental Home, is being built both on site and on our web site to assist you in learning about the elements and affordability of green building. 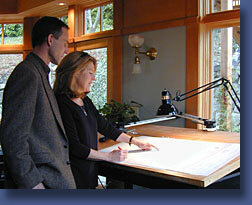 Pat Schader, also a member of the Seattle Design Center completes any furnishing or interior decorating needs. She will have ideas for you on putting your room together with fabrics custom furniture, area rugs, lighting and accessories. This talented team has created a series of short lectures and hands on seminars known as "Damsel Design Socials" to bring the latest trends in home building and design to you. For more information on all aspects of your home design contact us. Web site design by Acies Communications.